Looks great in bedroom as a sconce. Husband loves it. 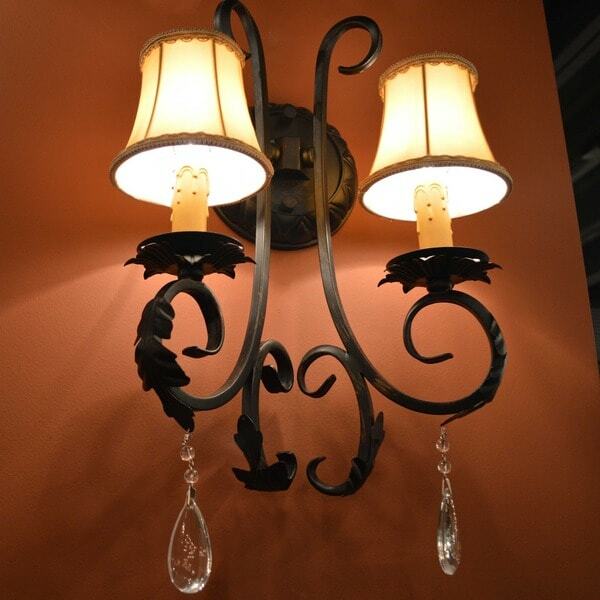 This stunning 2-light Wall Sconce has a sophisticated design with old world flair. Featuring a handsome Flemish Brass finish and finely cut premium grade crystals with a lead content of 30-percent, this elegant wall sconce will give any room sparkle and glamour. Dimensions 13.0 In. X 13.0 In. X 20.0 In. To bad this did not come with LED lights otherwise, im enjoying this. One arm of the sconce is bent that causes one light to not be straight. However I did compensate for the flaw by adjusting the shade. It is beautiful but imperfect. Wall sconces are stylish light fixtures that can be used in your bedroom to create a personalized ambiance, highlight architectural features, and complement your bedroom decor. Use this guide to help you choose a wall sconce that will enhance the look and feel of your bedroom.